Coaster Dynamics is educational software that combines the fun of designing a virtual roller coaster with learning physics. Coaster Dynamics is a computer simulation game that employs accurate mathematical calculations to model the behavior of a real roller coaster. As a virtual roller coaster designer, you start with a basic track layout and then modify it by changing the types and sizes of track elements. These track elements (vertical loops, corkscrew loops, and hills) are individually scalable, so every track is unique. Click here for a full-size screen image. Your design goals are for the roller coaster car to make it all the way around the track, and finish with a speed close to zero, while never exceeding a maximum force on the rider of 5 G's. As in real life, these design goals are subject to the laws of physics... and you'll learn that not all track configurations are workable. In the process, you'll come to understand the same design considerations that govern the development of real roller coasters. Even if you're a roller coaster enthusiast, not looking to learn physics, you'll enjoy the challenge of designing a virtual roller coaster -- and will find yourself learning while having fun at the same time. 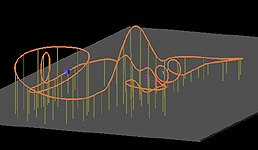 Unlike other roller coaster computer games, the focus of Coaster Dynamics is on the educational potential of roller coasters. This is accomplished with the Coaster Lab -- a set of companion materials that help teach basic concepts in science and physics using Coaster Dynamics as a virtual laboratory for conducting experiments. First, during the design of your roller coaster, Coaster Dynamics will provide Design Hints when a problem occurs -- for instance, when the G force in a loop is too large, or the speed is too slow or too fast. The Design Hints will suggest a way to correct the problem, and offer further information which will allow you to calculate a solution to the problem using basic physics principles. Second, the Coaster Lab includes a set of Coaster Lab Lessons suitable for use in a classroom. The Coaster Lab Lessons are laboratory exercises designed to fit into a typical classroom format, and cover fundamental topics normally included in the study of dynamics and Newtonian Mechanics in a first-semester introductory physics course. Also, the Coaster Dynamics Physics Primer is included -- which is a summary guide to roller coaster physics. It covers the basic topics required to understand and analyze roller coaster motion. It is an excellent supplemental resource which can be used in conjunction with a comprehensive physics textbook. Click here for more information about the Coaster Lab. Coaster Dynamics will run on a PC with Windows 7, Vista, XP or 95/98/Me. A sound card with speakers, and a 300 MHz Pentium 2, or better, is recommended. Coaster Dynamics is distributed as shareware. You are given the right to freely use Coaster Dynamics for evaluation purposes only. By paying a Software License Fee, you will become a registered user of Coaster Dynamics and will receive a Software License Password. For more information or comments about Coaster Dynamics, send email to webmaster@CoasterDynamics.com.